745 was born in 1995 from a year old ewe (867). 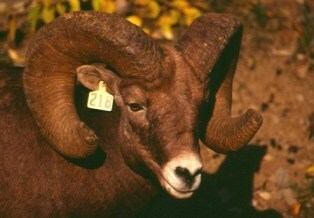 He had a quite successful life, becoming alpha-ram at 7 years-old. He gained his title by wining a fight over 218 (a 12 year-old ram of 136 kg) and he remained the alpha male over the following year (2003). 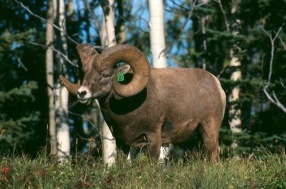 In the 2003 fall, 745 was a heavy ram weighing 144 kg, almost 10 kg bigger than the males against which he competed for the title in the previous year. He was killed by a cougar in the winter of 2004 and we found him dead. The horn measurements taken after his death revealed that he managed to grow horns over a meter long (right horn: 104 cm and left horn 106 cm) and of 40 cm of diameter. 745 in 2002 7yrs old. The photo was taken in 2002 when she was 12 year-old. The photo was taken in the year he was out competed by 745. 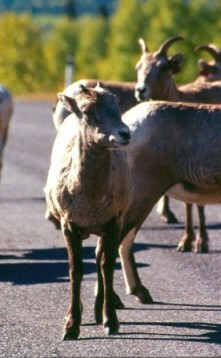 967 a female born in 1982, is the oldest sheep we have monitored at Sheep River. She was 18 years old when she died of unknown causes in the winter of 2001. During her life, she produced 8 offspring that survived to weaning and 5 of them survived to one year of age. One of the best mums seen at Sheep River was female 190. She was born in 1988 and lived until 2002 when she disappeared over winter. In the last year of her life she had managed to lose both of her horns. She produced 8 offspring that survived to one year of age. Her first two offspring were female but then she produced only male offspring until the end of her life. Her mother, number 15 (born in 1981) was also quite successful at raising offspring, she produced 4 (including 190), 3 females and one male. 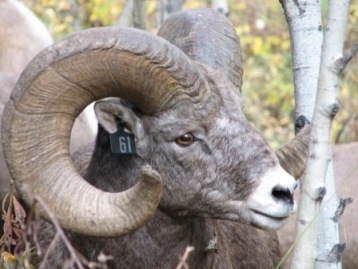 Since 2000 the biggest ram we have weighed at Sheep River was 706. At 8 years 706 was 154kg!! This picture was taken in 2006 few days before he was weighed. This female broke her left horn in a trap in early June 2001 as a 2 year-old. Nevertheless, she managed to be the heaviest female ever weighed at Caw Ridge. She was 95.2 kg on 28 July 2005, at 6 years old. Male reproductive success is highly variable. 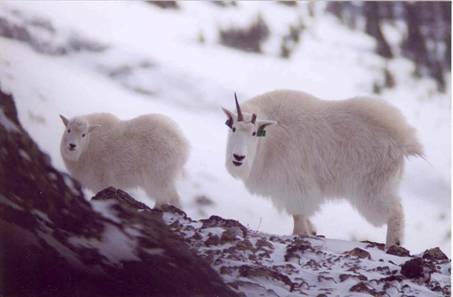 Males use their powerful horns and size to fight for females during the rut. 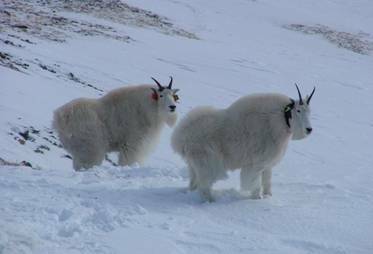 Interestingly, two of the most productive males not only scored with female goats, but they managed to gore us during captures! Although grizzly bears are of greatest concern for personal safety, the greatest material damage is definitely inflicted by hoary marmots, who gnaw everything imbibed with perspiration: the seats and handles of ATVs, the inside of helmets, backpacks, coolers, and so on. 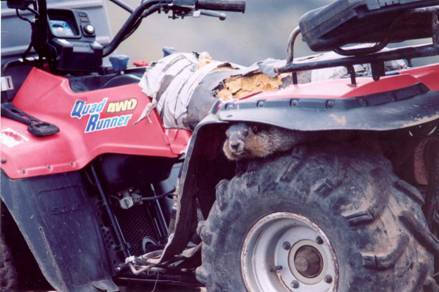 Here is pink-pink, a marked marmot that was chewing on the ATV’s seat a few seconds earlier. Over the years, more and more people came to work at Caw Ridge. 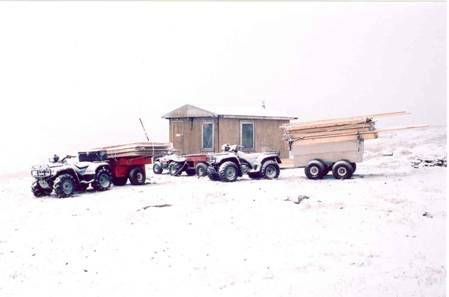 In 2004, we decided to enlarge the cabin. In September, we took materials on the mountain with ATVs and small unstable trailers. 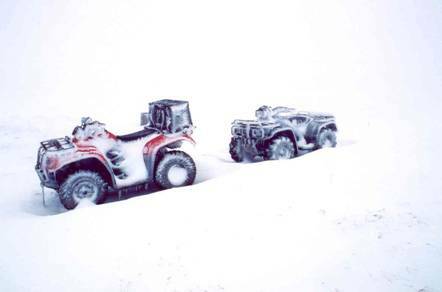 We were then stuck in a snowstorm for 3 days. We therefore had to build the extension in the snow and to shovel the snow outside the camp!